Who knew single payer health care would become such a popular topic so quickly in 2016? But the Democratic presidential debates between candidates Hillary Clinton and Bernie Sanders have moved single payer front-and-center as a key topic. And it doesn’t appear to be going away any time soon. Within that backdrop we thought it was the perfect time to showcase Pennsylvania businessman Richard Master, CEO of MCS Industries, Inc., and his amazing project “Fix It: Healthcare At The Tipping Point.” MCS Industries is a $200 million a year company based in Easton, Pennsylvania, and Master was the driving force behind this documentary that delves into the heart of how America’s fractured and dysfunctional health care system needs to change – to a single payer system. Among other things, our current health care delivery system, even after passage of the Affordable Care Act (ACA) creates an unsustainable burden on U.S. businesses. 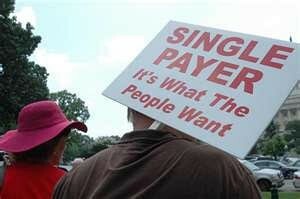 Single payer has been discussed from every angle – political, social, and economic. But few have looked at the positive impact single payer could have for American business. Fix It becomes one of the first attempts to say to American business: We’re being snookered by the current for-profit health insurance companies and they’re laughing at us all the way to the bank. 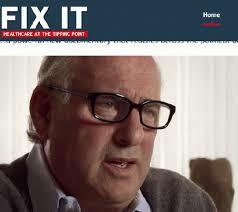 The documentary – offered in a 38 and 58 minute version – features input from some of the nation’s leading health care experts, including Don Berwick, the former head of the Centers for Medicare & Medicaid Services; Ted Marmor, a professor of public policy at Yale; Gerald Friedman, economics professor at UMass-Amherst; Wendell Potter, former health insurance executive, and Michael Lighty, Director of Public Policy at California Nurses Association/National Nurses United. This riveting film ultimately peels back the onion on how the current for-profit health insurance industry essentially perpetuates a system of waste and abuse for American businesses. And, as Master points out, what business person is going to tolerate waste and abuse? “We have to watch every penny of overhead,” Master says in the film. “And one of the costs we were trying to control that was so confounding was health care costs. We had seen double digit premium increases, which was more than any other expense has increased over same 10 year period.” So Master chose to do what any business person would do with a problem of that magnitude impacting his business – he started investigating and trying to find a solution. The result? The fabulous project that produced Fix It. The film mesmerizes the audience as it takes them on tour to Taiwan and Canada, two highly effective single payer systems, and it destroys the myths and misinformation about the Canadian single payer system. While in Canada, the film crew interviews Dann Konkin, a member of Canada’s conservative party and president and CEO of Ampco Manufacturing. Konkin explains how he looked at opening a U.S.-based operation but when he factored in the additional nearly $1M it would cost him for health insurance, it became a non-starter. “I don’t understand why my fellow conservatives in American don’t embrace single payer,” Konkin tells the viewers. Single Payer — what the people AND business want. You’ll see single payer continued to be debated a lot this spring. You’ll see it argued from the standpoint of “health care is a human right” (which it is). Other will run so many facts and stats past you, you’re head will spin. And still others will tell you that unlike every other educated country on the planet, Americans just aren’t smart enough to figure how to implement single payer. It’s just too hard. But, Master and the documentary Fix It approaches it from a different perspective: Being in the health care business for American employers is wasteful, inefficient, and provides no value to the products they produce and sell. Being in the health insurance business when there is another alternative puts an albatross around their necks as they try to stay competitive in a global market. Most U.S. business leaders/CEOs have been selected for their position because they have demonstrated a rare combination of intelligence, vision, and leadership required for confronting difficult issues. And, as pointed out so clearly in Fix It, health care has a major impact on every employer’s bottom line. If there’s a more efficient way to do it, business should be interested and supportive. This entry was posted in FEATURED, Single Payer-Health Care Reform, Social Justice, Thoughts on Life and tagged Fix It, healthcare reform, Richard Master, single payer, wendell potter. Bookmark the permalink.